This POD Compression T-shirt features quality compression technology that accelerates the blood flow and the oxygen supply to your muscles. The result: you maximize your warm-up, keep your muscles activated and speed up your recovery time. Engineered with a spandex and body-mapping seams, the Compression T-shirt of.. Engineered with a spandex and body-mapping seams, the Compression T-shirt offers perfect body coverage and lets you move and fight naturally. Its micro-fiber fabric delivers the ideal thermo-regulation by effectively pulling away sweat from your skin for a fast-drying effect. Day after day, its anti-microbial properties keeps your Pride Training Gear away from the growth of odor-causing bacteria. 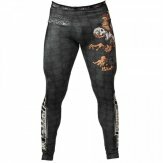 As an ultra-comfortable Venum Base Layer that can be worn alone or underneath a Ju Jitsu gi, the Rash guard Compression T-Shirtwill be as good as your second skin. 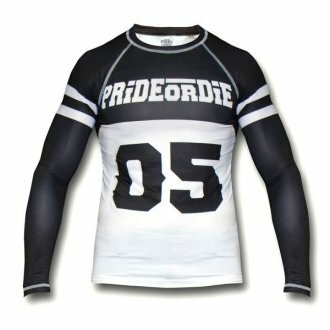 Prideordie Compression Technology: provides the optimal pressure area on muscle to make you go harder, for longer and recover faster. 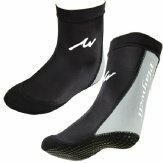 Enhanced Moisture Management Properties: keep your gear dry and fresh. Sublimated fiber design for an eyes-catching attitude.